Have you ever suffered from post-holiday blues? Even though I love my job, I find the first week back at work after a holiday is often slow and somewhat tedious. But I make it through because I always have another adventure to plan for or a new destination to research. That’s the thing about travel – it inspires more travel! I live in alternate realities: I have a “Monday-to-Friday office job” but I am also a part-time traveller, blogger and freelance writer. I love working full-time and travelling part-time. It’s a lifestyle that works for me and it means that I am not sacrificing one aspect of my life for another. Rather, I am getting everything I want right now. We drastically changed our lives so that we could travel the way we do. Daniel and I left Australia in May 2012 to move to the UK. We left our secure jobs and good incomes, spent much of our savings on a wedding and a honeymoon, and had a great adventure travelling through the US and France. As in every great travel story, we had more than a few unexpected delays (and expenses) and arrived in the UK, broke and desperate for work. Our first few months in London weren’t great. Daniel worked awful hours in hospitality and I had an admin contact in an office. We were like two ships passing in the night, trying to make ends meet and establish ourselves in a new city. There were many times during that first 12 months in London that we questioned our reasons for being there. We couldn’t afford to take the time off to travel through Europe every weekend like we planned. In our first 12 months in London we went to France (to visit my parents), Egypt (because we got 2 for 1 tickets), and camped at Glastonbury Music Festival and in Spain. We learned a lot about budget travel that year. Even though we couldn’t afford to travel as much as we wanted and it seemed like we were wasting our time, and our university degrees, moving to London was the best thing we ever did. The work experience and life skills that we gained during our first few months of marriage and the first two years we lived in London were priceless. I think we are better people and harder, smarter workers for it. And the lives that we live now reflect this. How do we travel as much as we do? After months of hard work and several temporary contracts, Daniel was offered a sponsored role at his company and we made the decision to stay and work in the UK. Without a mortgage, cars and children (choices we have made), we were “free agents” and we loved the lives we had made for ourselves in London. Yes, that’s me and Daniel… hard at work. Luckily, Daniel’s sponsorship and my work as a freelancer/consultant has afforded us to spread our wings and travel more widely and more often than we were able to before. Each year, we spend close to 25% of our joint income on all things travel. That includes everything: flights, transport, accommodation, tours, transfers, activities, spending money, and festival tickets. Compare this to the 28% of our joint income we spend on rent and bills in London and it is clear that we love to travel. We have fun challenging ourselves to think outside the box, but we continue to be smart about where we travel to and how we travel. Ultimately, what you do with your money, your time and your life is your choice. No-one else can make that decision for you. And, travelling isn’t the first choice for a lot of people. It still surprises me how often people tell me that we lead such an amazing life and they want to do the same… and then they don’t. Some people have genuine reasons why they can’t travel on a frequent basis. But others seem to constantly use the same old excuses: “I have job”, “I have a house”, “I have debt”, “I don’t have time”, and “I’m waiting for a promotion”. It might take time to pay off your debt or rent out your house, but if you want to travel, you can change your circumstances. And, want to know a secret? I’ve been promoted faster than colleagues and friends by being open about my goals with my manager or leaving a job that I loved for the unknown. If you are a hard worker and a company truly values you, they will work out a way to keep you. 2. How much time can you take off work and how do you want to spend that time? Different countries and companies around the world have different annual leave allowances. But sometimes you can also ask for leave without pay. We plan about 12 months ahead to figure out how we can make the most of our annual leave and public holidays (bank holidays) throughout the year. We prioritise what is at the top of our list of things to do and see in that year, and how much time and money we will need. We also schedule when we have to purchase festival tickets, flights and accommodation, which helps with budgeting. It’s hard to juggle your time off between family, friends and travel. Make a conscious decision and stick to it. Alternatively, invite your family or friends away with you! We travel with family and friends all the time (too much?) and we love it! 3. How much money can you save, and what portion of that will be for travel? Keep track of your money and be honest about your expenses. Is there a small portion of your income that you can set aside each month for holidays? Can you sacrifice something (your morning cup of coffee, cigarettes, magazine subscriptions, weekly spray tan) to redirect that money to travel expenses? We have a “family budget” spreadsheet. It tracks all of our income and all of our expenses including rent, bills, public transport, groceries and small things like gym membership and nights out. It also means that we can track what we are saving for travel and what we are saving for other things. Though, if I’m honest, we don’t have much savings for other things. We are slowly saving for our first home and it will take us years, but we know this will take longer because of our current lifestyle. It is a conscious decision and one we are currently very happy with. If you have substantial expenses, such as small humans and big mortgages, you might think you can’t travel – but you can! If international travel is our of the question, travel in your own “backyard”. Have a “satycation” in your own city, find a camping place that is a short drive away to spend some time outside of the city with the family, or find someone (mum? dad?) who can look after your dog or rug-rats for a few days while you escape. There are options if you look and ask! In June we literally holidayed in our back garden. 4. How can you stretch your budget? What are you willing to sacrifice? 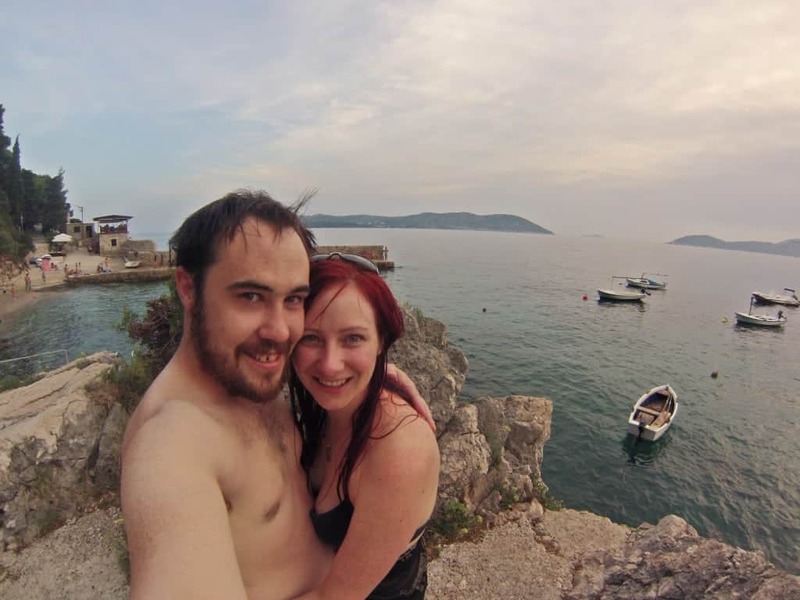 Recently we met up with friends in the Balkans (a relatively cheap place to travel). Because most people in our group were on very strict budgets, we decided to share the car expenses and camp in tents or stay in hostels rather than hotels. Daniel and I paid £150.80 for our first nine nights of accommodation. Because we had saved so much money on accommodation, we splurged on our last night and paid £146.59 for one night of beautiful accommodation in the Old Town of Dubrovnik. House and pet sitting, couch surfing and Wwoofing are ways you can reduce accommodation costs. You can also offset your accommodation costs by renting out your room or house on Airbnb while you are away. Overnight buses can be cheaper than flights. Buying groceries from the local supermarket is less expensive than eating out at restaurants. Start by saving £1,000/$2,000 per year to put towards two weeks of international travel. Then, each year, find a destination or holiday that you want to take that is within your budget. Rent out your room or house on Airbnb while you are away. This will provide you with a little income to cover rent or a mortgage. Ask your boss if you can take a sabbatical. It will surprise you how common this is and how open to the idea a company can be. People take time off work for all kinds of reasons – and travel is one of them! Work remotely. If you are in a job that allows you to work remotely, why can’t you work from a cafe in Berlin, or a beach in Guatemala? Or, work from home on a Friday to get to the airport earlier for a quick weekend break? Or offer to work from another office location for a few weeks? Create a job where you can work remotely (or become a freelancer) – can you design a web page, get paid for writing, or sell goods online? Or move overseas, like we did! Depending on your nationality (and passport status), you can apply for a working visa and find a job in plenty of countries around the world. Find out more from your local government agency.